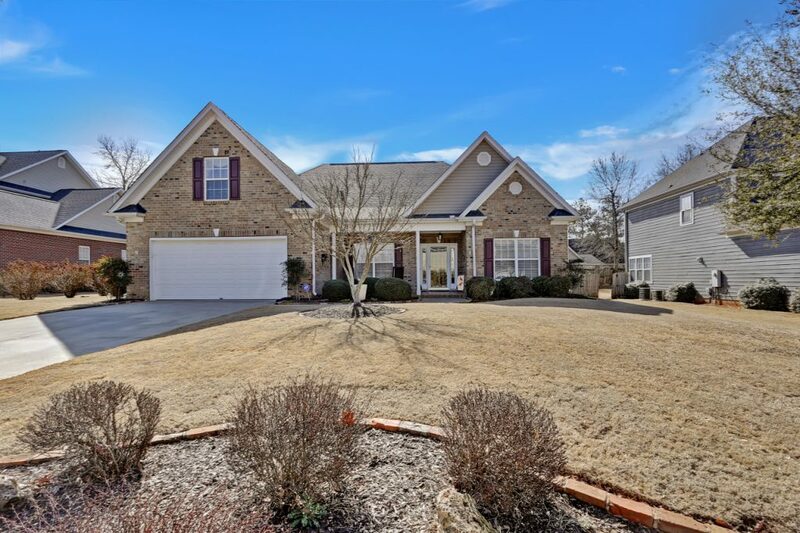 Beautifully maintained brick home with 3 beds and 2.5 baths. Lovely front porch perfect for a relaxing afternoon sitting on the rocking chair. Beautiful hardwood floors throughout the dining room, great room, hallway and master. Great office room for the home worker featuring French doors. Beautiful dining room with crown molding, chair rail molding, and a large open entry way. Good-sized great room with a gas log fireplace between two large windows allowing plenty of sunshine in. Well-presented kitchen featuring lots of counter space and cabinets with crown molding, pull out cabinet racks, newer appliances, smooth top range oven, as well as decorative tile backsplash. Large master bedroom located on the main level featuring a full bath with shower, separate tub, double sink, and walk-in closet. A bonus room located on the upper level which you can be used as a family room, sewing or hobby room, game room, home cinema, or den. A great size laundry room/mud room on the main level. A beautiful water feature with 7′ waterfall and 950 gallon fish pond. A fully covered deck with ceiling fan, another area under a fabulous pergola, and a separate grilling patio area. Fully fenced backyard featuring a beautiful locking decorative metal gate. You can’t go wrong in this well maintained brick home that offers a convenient family lifestyle with plenty of space for everyone to come together or spend time apart. Walk up onto the large front porch and enter into the foyer area to see the spacious dining room on the left and the office room to the right. The great room has everything you need to entertain or simply relax with the family. Inside, the home presents a generous floor plan comprising of an open breakfast area/kitchen, great room, 3 ample bedrooms on the main level, bonus room, office room, and laundry/mud room. Immaculate hardwood floors complement this brick home with plentiful natural light flooding in through large windows creating bright contemporary living. Outside, there’s a beautiful water feature with 7′ waterfall and 950 gallon fish pond which can be enjoyed from the covered deck. It’s the perfect place for entertaining!